We are new to git, and I want to set a tag at the beginning of our repository. Our production code is the same as the beginning repository, but we've made commits since then. A tag at the beginning would allow us to "roll back" production to a known, stable state. So how to add a tag to an arbitrary, older commit? git tag -a v1.2 9fceb02 -m "Message here"
Where 9fceb02 is the beginning part of the commit id. You can do git log to show all the commit id's in your current branch. There is also a good chapter on tagging in the Pro Git book. Warning: This creates tags with the current date (and that value is what will show on a github releases page, for example). If you want the tag to be dated with the commit date, please look at another answer. git tag -a v1.2 -m"v1.2"
git tag -a v1.2 9fceb02 -m "v1.2"
GIT_COMMITTER_DATE="$(git show --format=%aD | head -1)" git tag -a v1.2 -m "v1.2"
with f4ba1fc being the beginning of the hash of the commit you want to tag and v1.0.0 being the version you want to tag. Git (revision control): How can I tag a specific previous commit point in GitHub? 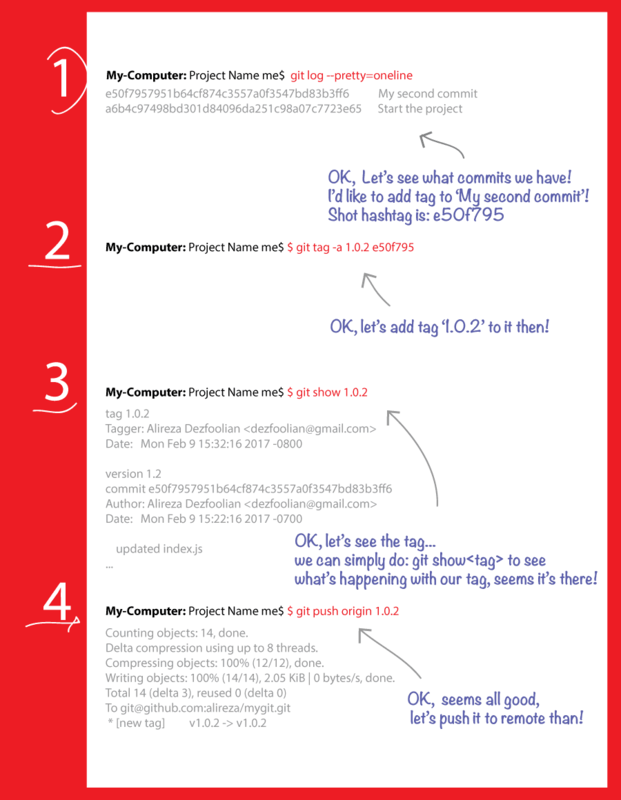 git tag -a 1.0.2 e50f795 -m "my message"
This is an old question, and the answers already given all work, but there's also a new option which can be considered. If you're using SourceTree to manage your git repositories, you can right-click on any commit and add a tag to it. With another mouseclick you can also send the tag straight to the branch on origin. where tag is set to the desired tag string, and commit to the commit hash. Not the answer you're looking for? Browse other questions tagged git version-control git-tag or ask your own question. How to “tag” a given commit with a branch?